For a planar Dirac–Coulomb system with a supercritical axially symmetric Coulomb source with the charge Z > Zcr,1 and radius R0, we consider essentially nonperturbative vacuum-polarization effects. 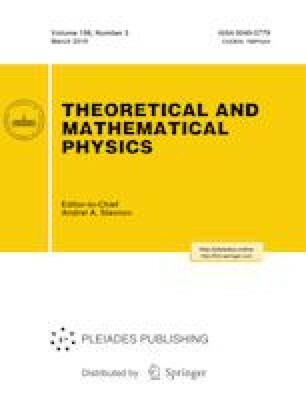 Based on a special combination of analytic methods, computer algebra, and numerical calculations used in our previous papers to study analogous effects in the one-dimensional “hydrogen atom,” we study the behavior of both the vacuum density ρVP(r⃗) and the total induced charge and also the vacuum-polarization energy EVP. We mainly focus on divergences of the theory and the corresponding renormalization, on the convergence of partial series for ρVP(r⃗) and ɛVP, on the integer-valuedness of the total induced charge, and on the behavior of the vacuum energy in the overcritical region. In particular, we show that the renormalization via the fermion loop with two external legs turns out to be a universal method, which removes the divergence of the theory in the purely perturbative and essentially nonperturbative modes for ρVP and ɛVP. The most important result is that for Z ≫ Zcr,1 in such a system, the vacuum energy becomes a rapidly decreasing function of the source charge Z, which reaches large negative values and whose behavior is estimated from below (in absolute value) as ~ −|ηeffZ3|/R0. We also study the dependence of polarization effects on the cutoff of the Coulomb asymptotic form of the external field. We show that screening the asymptotic value significantly changes the structure and properties of the first partial channels with mj = ±1/2,±3/2. We consider the nonperturbative calculation technique and the behavior of the induced density and the integral induced charge QVP in the overcritical region in detail. Translated from Teoreticheskaya i Matematicheskaya Fizika, Vol. 198, No. 3, pp. 381–417, March, 2019. Received October 26, 2017.